The leadership groups of the Commission of the Bishops’ Conferences of the European Community (COMECE) and the Council of the Bishops’ Conferences of Europe (CCEE) met Pope Francis this week. It has been a particularly “European” week for Pope Francis including his May 16 and 17 meetings with the leadership groups of the various institutions representing the bishops of the European continent. 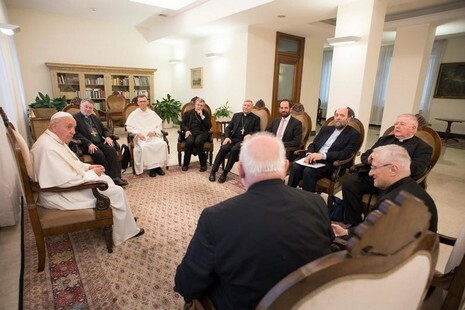 The pope on Tuesday, May 16, met at St Martha House with the Permanent Committee of the Commission of the Bishops’ Conferences of the European Community (COMECE). This body comprises delegates from the bishops conferences of the member countries of the European Union. Led by its president, Cardinal Reinhard Marx of Munich, who is also president of the German Bishops’ Conference, the COMECE delegation’s purpose was to brief Pope Francis concerning a dialogue on “Rethinking Europe” that is being organized in Rome in collaboration with the Holy See from October 27-29. “’Rethinking Europe’ is intended to be the beginning of a process of dialogue between representatives of the Churches (bishops and lay people) and the politicians who direct and bear political responsibility,” explained Cardinal Marx. The Rome Dialogue also aims to promote deeper reflection on the future of the EU in a bit to reawaken the enthusiasm shared by Pope Francis, who will also take part in the dialogue, in his various talks, the cardinal added. On Thursday, May 19, the pope also hosted the leadership of the Council of the Bishops Conferences of Europe (CCEE), which comprises all the presidents of the bishops conferences of Europe. This is led by Cardinal Angelo Bagnasco of Genoa, who is also the current president of the Italian Bishops Conference until his term ends next week. The new CCEE leadership group, which was elected in October 2016, is planning to focus on “the issue of secularization, which presses us towards a renewed evangelization of our Churches and our countries", explained Cardinal Bagnasco. “The Church in Europe believes deeply in the European continent,” he said. Youth issues were also raised as part of a symposium organized by the CCEE in preparation for the Synod on Young People. The CCEE also briefed Pope Francis on migration issues and the pope confirmed that he will participate in the meeting of national directors of migrant pastoral care to be held in Rome on September 22. “This is a commitment that we are going to pursue and intensify,” Cardinal Bagnasco said, insisting on the European commitment of his organization whose members include those from nations that do not belong to the EU. “The Church in Europe is a Church that deeply believes in the European continent,” he insisted. “Even more than that, the Church also loves the continent with its wealth of history, tradition, cultures and peoples who each wish to preserve their own identity as well as meet together in a spirit of unity and communion. "It is a continent that exists by virtue of the great plurality of its history as well as a unifying project based on the Gospel, in the Christian faith, which is its point of synthesis," Cardinal Bagnasco said. During each of these meetings, Francis will have heard a double European credo, namely the defense of the European Union in quest of a new lease of life (a project promoted by COMECE), and that of a Europe of peoples going beyond the EU. Te latter is encouraged by the CCEE.